Can Rabbits Eat Tomatoes? - The benefits and dangers of tomatoes. Yes, rabbits can eat tomatoes, but they should be an EXTREMELY LIMITED portion of their diet. Instead, rabbits should be fed a diet mainly of hay that is supplemented with a small amount of vegetables and pellets. 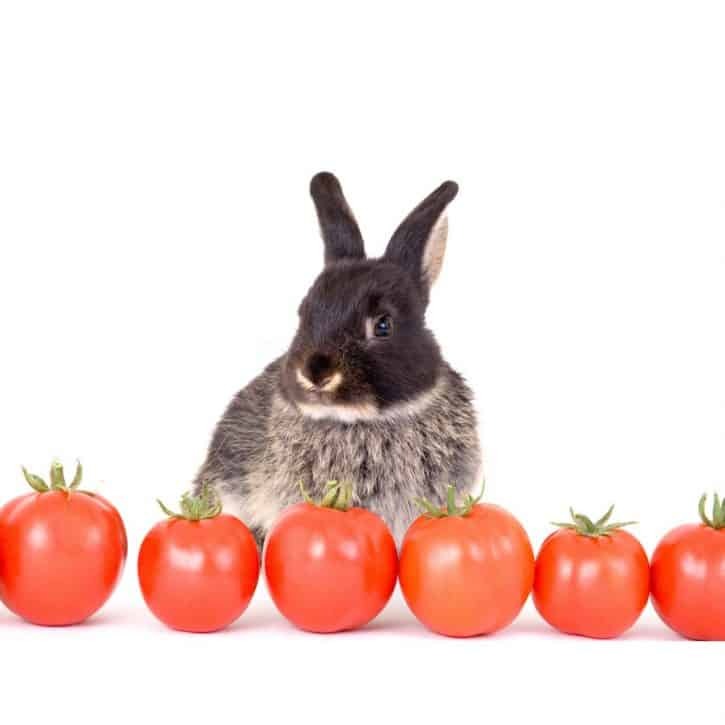 First, let’s look at what tomatoes are so that we can better understand whether they should be included in rabbits’ diets. Although they are often thought to be vegetables, tomatoes are in fact fruits from the family Solanaceae (the nightshade family that also includes potatoes, eggplants, and chili peppers). More specifically, since they do not have stones or pits, tomatoes are berries. However, due to their low sugar content in comparison with other fruits, they are often treated as vegetables and cooked (as opposed to being served only raw). Tomatoes are extremely high in water (around 95% water), and to humans have a savory taste that makes them a staple in many dishes. To rabbits, however, they are a delicious sugary treat. There are some benefits of tomatoes for rabbits. The main benefit would be their large water content which helps to keep rabbits hydrated. Tomatoes are also good sources of fiber which is essential to rabbits’ diets. Because rabbits do not have constant stomach movement (known as peristalsis) that helps them to digest their food, fiber is a key component of their digestion. Tomatoes are high in potassium which helps prevent hypokalemia in rabbits (low levels of potassium in the bloodstream). If you are concerned about low levels of potassium, some of the symptoms include stunted growth, muscle weakness, weight loss, and cardiac arrhythmias. Tomatoes are also full of the antioxidant lycopene which helps prevent cell damage and gives tomatoes their signature red color. They are also important for rabbits’ heart health, and it has been suggested that lycopene can help prevent heart disease in rabbits. Lastly, tomatoes are also known for their high amounts of vitamin C. Although unlike humans, who need to ingest vitamin C because our bodies do not store it, rabbits can make their own vitamin C from glucose. In fact, too much vitamin C can cause kidney damage in rabbits. Nevertheless, it has been suggested that rabbits that are stressed or anxious may benefit from the occasional tomato or other fruits high in vitamin C.
Sadly, there are some important cons to feeding rabbits tomatoes that you should keep in mind. One of the most important cons is that tomato plants are toxic to rabbits and only the fruit should be eaten. This is because tomatoes contain the alkaloids (plant compounds that have a physiological effect on animals) tomatine and solanine. Tomatine is a poisonous compound found in all parts of the tomato plant (including the fruit) but is largely concentrated in the leaves and stems. Solanine is a poisonous compound found in all species of the nightshade family that is also found mainly in the leaves and stems of the tomato plant. This means that you should always remove the leaves, vines, stems, and flowers of tomato plants. And, not only the plant but green unripe tomato fruits, are also toxic for rabbits. Some of the symptoms of these toxins are diarrhea, bloat, and stomach pain. Unfortunately, there is no set amount that is poisonous. Some rabbits can eat a little of these substances and be okay, and others can only ingest a small amount before being incredibly sick. Also, it is possible for these toxins to lead to death in rabbits. Unlike humans (who have a much higher tolerance of solanine and tomatine), rabbits have a very low tolerance. If you are worried that your rabbit has accidentally eaten part of a tomato plant or too much of the tomato fruit, then please contact your veterinarian immediately! Another con of tomatoes is their high sugar content. While humans probably don’t think of tomatoes as desserts, rabbits certainly do! Because of their high sugar content (by rabbit dietary standards), they should be considered treats. Overindulging in too many sugary treats can lead to a whole slew of problems with rabbits such as obesity, dental problems, and diabetes. Always portion control tomatoes for your rabbit. Just like humans, they have no will power when it comes to junk food! You should limit tomatoes to one or two slices about once a week. Depending on your rabbit’s size, the average tomato portion should be about the size of one cherry tomato. 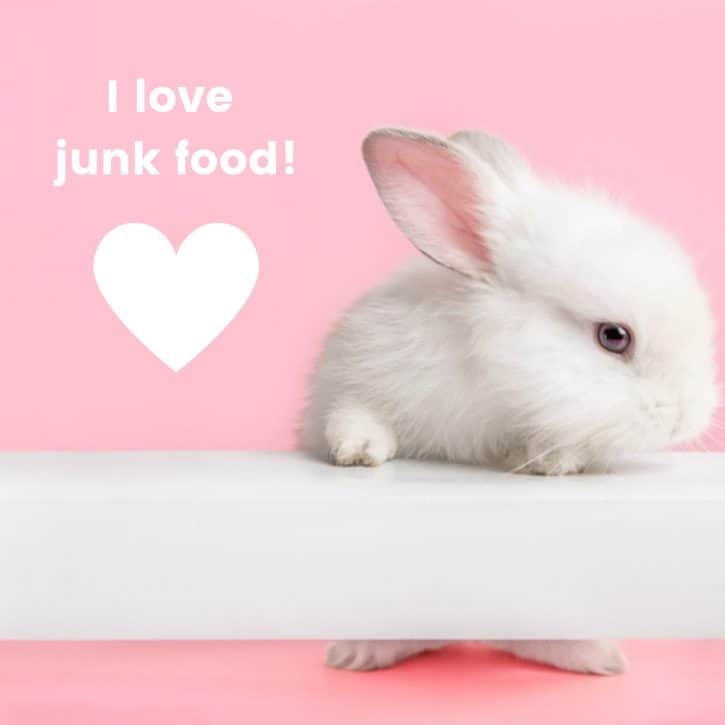 You should also never feed your rabbit cooked tomatoes (or ketchup) because they are full of unhealthy chemicals and lots of sugar that is bad for your rabbit. Not only that, but cooked tomatoes are even more acidic than raw tomatoes and can cause bowel problems for your rabbit. Additionally, tomatoes should always be washed to make sure they are free of any pesticides or chemicals that could be harmful to rabbits. Lastly, rabbits are known for their sensitive stomachs, so you should keep in mind that some rabbits will not fare well with tomatoes no matter how small the portion. It’s important to always introduce new food slowly into your rabbit’s diet and to always monitor for any signs of distress or loose stool. Summary of Can Rabbits Eat Tomatoes? There are some benefits to feeding rabbits tomatoes: they are high in water, fiber, potassium, lycopene, and vitamin C.
Unfortunately, there are also cons to feeding your rabbit tomatoes: they contain toxic compounds (tomatine and solanine), have a high sugar content, and can upset many rabbits’ sensitive stomachs. You should always remove the stems, vines, leaves, flowers, and seeds of a tomato plant and never feed rabbits unripe green tomatoes. It is also important to wash tomatoes and portion control them to help prevent illness in your rabbit. Tomatoes should be limited to one or two slices a week, and the portion should be about the size of one cherry tomato.